If you plan ahead you can eat free, or at least 50% free, with the bogos, for your birthday month at the max and the two weeks around your birthday at a minimum. The key? Sign up for the birthday clubs or email lists for your favorites. It's definitely more chains than independent local restaurants, though last year, just by the virtue of celebrating my birthday in their establishment I got a free pancake at Snooze and cheesecake at Katie Mullens. Papa Murphy's Pizza - Free cookie dough with the purchase of a pizza...and I managed to use a free cheese bread coupon too! postcard that must be "cheerfully submitted" when I claim my drink. Red Robin - They used to email a free birthday burger. Now you need to have their loyalty card. I should be getting one in the mail, but haven't seen it yet. Panera - A special treat has been loaded onto my card...I have no idea what it is. I was pleasantly surprised in December when I had a free coffee drink...added bonus! Tokyo Joe's - Rather than getting free food on your birthday, they surprise you with a freebie on your half birthday. In July. I'll be ready. If I get more this week, I'll add them to the list. If your birthday is in February you'd best get crackin'. 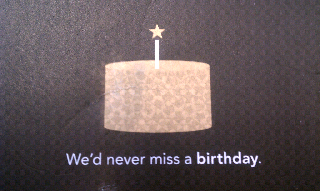 Recommendations for other birthday coupons? Post them in the comments. How cool is this post! Lots of places with birthday benefits that I am sure will may the day more special. Sweet of you to pull these together! Have a wonderful day.